Complaint and conflict resolution is a component of every job, but some professions are more susceptible to complaints. Accountants, for example, may be on the receiving end of some heated complaining as they deal with a person’s income. Because private investigators can work on cases in which emotions run high, they may see more complaining from clients who are facing grief, loss, or betrayal. Regardless of what type of business you are a part of it’s important to have complaint resolution procedures in place. It only takes one dissatisfied client to show you many ways your firm can improve. Whether or not you or your company have personal limitations in dealing with an unsatisfied client. What strengths and weakness you have when it comes to dispute resolution. Whether or not you have good conflict resolution procedures in place. 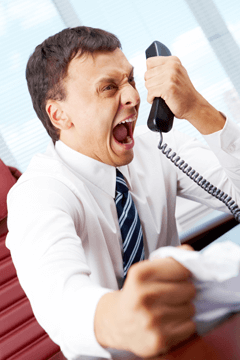 What you need to change about your complaint handling process. Who in your company has a the best demeanor and background for handling complaints. Who in your company is not suited for handling complaints and shouldn’t get involved. Who should be fielding complaints when they do come in and how that communication should flow through the company. Where any gaps in your complaint intake and follow up processes are occurring. What employees should be interacting with clients and what ones should focus on backend work. Which team members need more customer service training. What information, if any, could have been provided up front and prevented the issue from occurring. What items were not clear in the original agreement. Where any major breakdowns in communication with clients are occurring. What internal communication breakdowns are happening within your company. What demeanor and phrasing works when your firm is to blame for the mix up. What demeanor and phrasing works when your firm did not make a mistake. Some procedures and processes might not be worth changing even in light of a complaint. It might be time to invest in customer relationship management software. It might be also time to revisit your strategy for communicating with clients and customer service. What may be preventing you from getting repeat clients. What your current clients might be frustrated with but not telling you about. Why you may have lost past clients. What is most valued by the people who are using your services. Your firm may not be delivering in full what it is promising. What type of clientele your firm has the best experience working with. Whether or not you have the tools needed to turn an unhappy client into a happy client. Responding to a complaint the right way makes a big difference. Your attitude or temper might need some minor adjusting. It might be time to invest in some conflict resolution literature or to attend a seminar on handling complaints. What works for one client and is preferred by that client might not work for a different client. You may need to put your customer service policy and procedures in writing as a reference guide for employees. There are components and procedures that your clients might not understand. Your employees might not understand something and therefore communicating that to clients incorrectly. There may be complaints that are severe enough to warrant a refund. There may be better options for resolving a conflict than supplying a refund. How you can improve your services or products. How you can improve or change the way you sell your services or products. More insight into what your client’s needs are. Whether you’re approaching complaints as a nuisance or a learning opportunity. Approach is everything and attitude makes a difference. What component of the process is a larger issue. (i.e. invoicing vs. phone etiquette). When is the right time to respond via phone vs. via email. You might be waiting too long to respond to complaints. How frequently your clients want updates. How forgiving your unhappiest of customers are going to be. What caliber of mistakes your company is making (i.e. being late to a meeting vs. completely forgetting to follow up). Whether or not you’re making it easy enough for your clients to complain. What method of complaint filing will give you the best information from your clients (i.e. anonymous survey, phone call, email). Each complaint will be different with a different client, different set of circumstances, and different issues being brought to the table. By approaching each complaint as a learning opportunity you will be able to continually fine tune your company’s procedures and processes. If you’re not getting complaints, consider making it easier for your clients to make complaints. In making it easier for your clients to complain you will have better opportunities to identify what isn’t working and ultimately make all of your clients happier in the long run.